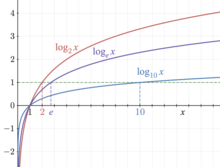 In mathematics, the logarithm is the inverse operation tae exponentiation. That means the logarithm o a nummer is the exponent tae which anither fixed nummer, the base, must be raised tae produce that nummer. In simple cases the logarithm coonts factors in multiplication. For example, the base 10 logarithm o 1000 is 3, as 10 tae the pouer 3 is 1000 (1000 = 10 × 10 × 10 = 103); 10 is uised as a factor three times. Mair generally, exponentiation allaes ony positive real nummer tae be raised tae ony real pouer, alweys producin a positive result, sae the logarithm can be calculatit for ony twa positive real nummers b an x whaur b is nae equal tae 1. The logarithm o x tae base b, denotit logb(x), is the unique real nummer y such that by = x. For example, log2(64) = 6, as 64 = 26. This page wis last eeditit on 24 Mairch 2017, at 17:50.